Kyle Busch survived a crash-filled Camping World Truck Series race at Bristol Motor Speedway and won the O’Reilly 200 on Wednesday night. He took the white flag to make the race official just as a crash behind him brought out the yellow. Good thing, too. Busch said afterward that his truck was running out of fuel. The victory was the third of the season in the series in just eight starts for Busch, who won the pole earlier in the day but had to start from the rear of the field after changing an engine after qualifying. “It worried me a little bit just having to start back there and try to come through traffic really unsure,” Busch said. “Some guys, they qualify and do their race adjustments and go for the start of the race and sometimes you can get it too loose and you never know what can happen in front of you. This is Bristol, anyway. It turned out everything was all right. 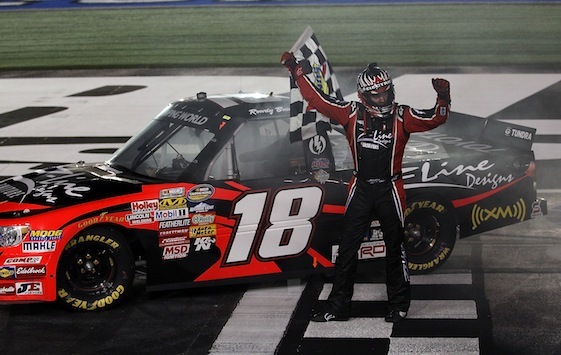 The finish gave him three straight victories at the Bristol .533-mile track. The race featured 12 cautions, a red-flag stoppage with two laps to go and had a green-white-checkered finish. Ron Hornaday Jr. was third and Mike Skinner was fourth. Point leader Todd Bodine finished fifth.